Barry Pethers' Memories "Stayin' Alive"
At the age of 15, Barry Pethers will never forget that day at Chtistmas 1995 when he was invited with his father to the Surrey home of Bee Gee Maurice Gibb. 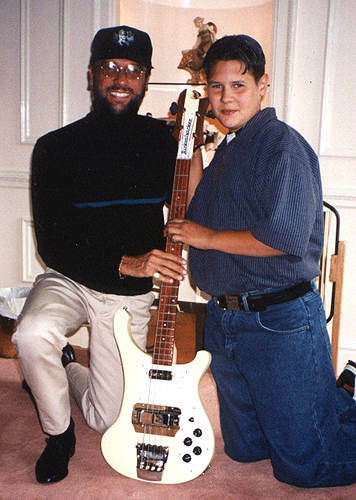 He mentioned to Maurice that he was taking Bass lessons at school. Maurice said he had many basses in the studio back in Florida and that he would send one to him when he returned to the States. Three weeks later, Maurice phoned to say that he had contacted Rickenbacker to see if they could make a 4001 in the old 60's, 70's style. Their reply was, we make a limited edition Chris Squire, would this be ok? Maurice said it would be fine and there the story begins. About three months later, on May 3, 1996, Barry received a special delivery. A black cab pulled up at the house and there it was. Opening the case for the first time was special in itself. This beautiful cream bass glowed above the rich blue lining of it's case. It was like a dream come true. Can you imagine how Barry felt about Maurice at that time? What a wonderful kind thing to do by one of the world's true superstars. Barry phoned Maurice across the Atlantic that evening to tell him it had arrived. He said it was the greatest gift he had ever received. Maurice was so humble and said if you are pleased I am, just play and enjoy. He also said that when it was delivered originally to his home, it looked so good he wanted to keep it himself. Young Barry went from a guy not rehearsing between lessons, and about to give up, to a man possessed. He never put the Rickenbacker bass down and his playing went from strength to strength. Three months later Barry and his family visited Maurice who was then back in the UK filming the South Bank Show. 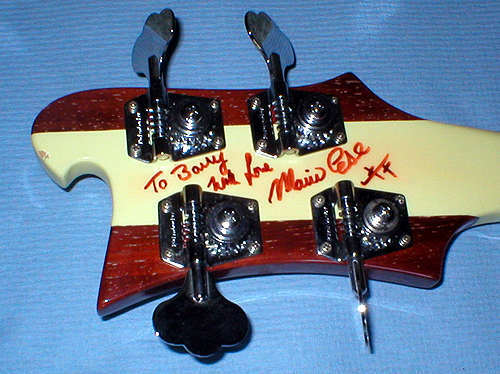 In August 1996, Maurice signed the back of the headstock "To Barry, with love, Maurice Gibb". Maurice was such a generous and lovable guy. He got a kick out of helping other people. Barry, now 25, has a unique style of his own and is rated very highly in the UK. He plays and gigs every moment he gets. It is nothing for him to perform a three minute solo on stage. He played to Marcus Miller in London with Marcus saying I am very impressed and look forward to hearing great things in the future. 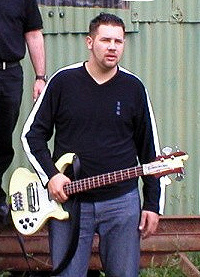 He was also invited to play for Bruce Dickinson (Iron Maiden) at a solo gig. He is now in the band Trafficker and hopes for big things in the future. They even have the opening track on a tribute album to Maurice. Barry says that Maurice inspired him to play at a time when he was about to throw it all in. "If Maurice had not been so generous my life would be different now. I owe him everything. His warmth and love will stay with me forever."